Nothing fancy here, once again. Just a bowl of broccoli cheddar soup and a few pieces of really good bread. 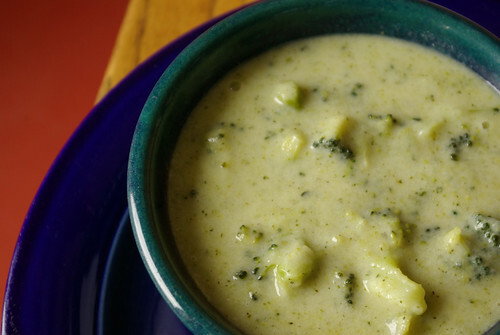 Broccoli cheddar is one of my all-time favorite soups, but I never get it anymore – it seems like the local pubs never have it on the menu these days. And when I decided to make some myself, I couldn’t find a single recipe for it anywhere in my vast cookbook collection – so I made one up. I think it worked quite well. I sauteed a chopped onion in butter, then added flour, then chicken stock, water and broccoli stems. When the stems were soft, I used an immersion blender to puree it all up, then added the broccoli florets and let them simmer until just tender. I added a splash of half-and-half and a good handful of grated raw medium cheddar. 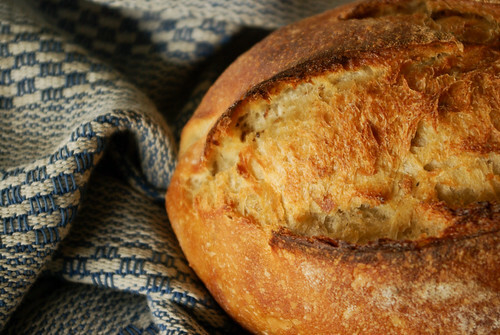 To go with, I bought a loaf of Samish River potato bread, which was the perfect mate: soft but crusty, with a full sourdough/potato flavor. A lovely dinner. This is a test…what kind of beer would you serve with this? R says IPA..I don’t believe it. Actually, I want this receipt. I LOVE Broccoli Soup. Hmmm. I think the best thing to drink with it would be a slightly buttery white wine. If it was beer…I tend to drink IPA with everything, indiscriminately, but maybe just a good crisp pale ale would suit best, nothing too heavy. We happened to have an open bottle of red wine when I made this, and it was a terrible match.